Tata Motors sold 78,756 UVs in FY2019, notching 51% YoY growth and growing its UV market share to 8.37%from 5.63% in FY2018. The Nexon compact SUV continues to be its prime growth driver. 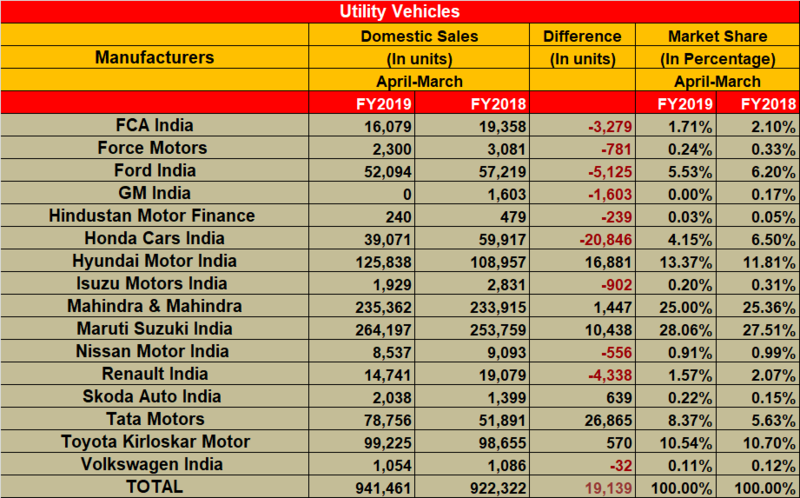 The Indian automotive industry has just concluded what was one of its worst fiscals ever in the past 12 years, and the impact of the slowdown was felt by all vehicle categories, including UVs, which closed the financial year with dismal 2 percent growth. Of the total PV sales of 3,377,436 units (+2.70%), UVs went home to 941,461 buyers, a mere 2 percent uptick in demand over the 922,322 units sold in FY2018. To set the perspective straight, their performance in FY2018 was no less than remarkable with a net growth of 21 percent coming over and above the 761,998 units sold in FY2017. This high double-digit performance set the expectation bar high from the segment, and hence the disappointment now. Of all the key PV makers in the market, it was Tata Motors, which kept its run going strong amidst an environment of poor consumer sentiment. The company recorded total UV sales of 78,756 units, which constitutes handsome 51 percent YoY growth and helping the company grow its UV market share to 8.37 percent compared to 5.63 percent in FY2018 when it had sold 51,891 utility vehicles. The highest contributor to this robust performance is the Tata Nexon – the company’s sole compact SUV – which was launched back in September 2017. The crossover saw rollout of its 50,000th unit from the Ranjangaon plant in August last year and eventually culminated FY2019 with overall estimated sales of around 55,000 units between April 2018 and March 2019. The Nexon was assisted by the Tata Hexa, a substantially bigger SUV and one competing with the likes of the Mahindra XUV 500 and even the Toyota Innova Crysta. Tata Motors sold an estimated 7,300 units of the Hexa in FY2019. While no other manufacturer has been able to record incremental growth akin to Tata Motors, but Korean carmaker’s Indian arm Hyundai Motor India too fared rather well with a 13.37 percent UV market share by the end of the fiscal, growing over 11.81 percent in FY2018. The Creta has been one of the most consistent performers in the UV space, enabling the carmaker retail a total of 125,838 UVs in FY2019, a significant jump of 16 percent over 108,957 units sold in FY2018. The Creta, which received a facelift earlier in May 2018, has seen smooth sailing with a total volume run of 124,300 units – accounting for 98.77 percent of Hyundai’s UV sales in the fiscal. While the country’s leading carmaker Maruti Suzuki India saw a growth in overall UV volumes based on sales of its S-Cross, Vitara Brezza, Gypsy and the Ertiga, the company could only but marginally improve its market share to 28 percent from over 27.51 percent pegged at the end of FY2018. Maruti sold a total of 264,197 UVs in FY2019, compared to 253,759 units sold in the previous fiscal. Maruti launched the Vitara Brezza facelift in May 2018, which also takes the credit of bringing the bulk of the company’s UV volumes, and eventually, the second-generation Maruti Ertiga MPV later in the year in November, which together are keeping the company’s sales outlets busy. Two primary UV players – Toyota Kirloskar Motor and Mahindra & Mahindra – couldn’t expand their market share any further over FY2018, even as the latter was seen launching a slew of products including the TUV 300 Plus, and the XUV 300 in the market in FY2019. Where Toyota saw an overall uptick in sales to 99,225 units in the fiscal over 98,655 units it had sold in the previous year, the Japanese giant maintained its UV market share at 10.54 percent (FY2018: 10.70%). Similarly, Mahindra & Mahindra registered total UV sales of 235,362 units in FY2019, keeping its market hold almost similar at 25 percent (FY2018: 233,915 / 25.36%). On the other hand, Honda Cars India, which was seeing some good response in FY2018 with its WR-V crossover launched in March 2017 saw all the steam dying down around the Jazz-based model with an increased assault from the competition. Honda’s overall UV sales in FY2019 slumped to 39,071 units, pulling its market share down to 4.15 percent, when sales in the previous fiscal had cumulated to 59,917 units leading to a growth in market share to 6.50 percent. The company had launched the new CR-V in the premium segment in October last year. Even though the overall market environment might be a little dull, UVs don’t seem to be losing their charm in the buyer’s mind anytime soon. It is very much evident from the fact that carmakers are ready with a slew of new model launches in this year – FY2020 – and two big entries into the Indian market are going to be with UVs – Kia Motors with its Kia SP2i and MG Motor India with its MG Hector. Even before that we have Hyundai Venue setting expectedly creating new avenues for the Korean brand in India on April 17. Times, yes, they still are exciting.